Add lemon juice and corn flour in a bowl and mix them well. Take a pan and pour coconut milk in it. Then add corn flour mixture to the pan and Put it on low flame. Then you can add almond oil (or any oil of your choice). Boil it for 5-10 minutes and stir it well until no lumps. After the batter get thicker and runny turn off gas let it cool down for about 20-30 minutes. Before applying this mask on to your hair first, remove all tangles. Comb your hair properly and section them. Then apply the mask one by one on each section from root to end. Once you are done applying mask leave it on for 30 minutes or so. After it dries out you can wash it off with mild shampoo. You don't need to apply conditioner after using this mask, how cool is that! 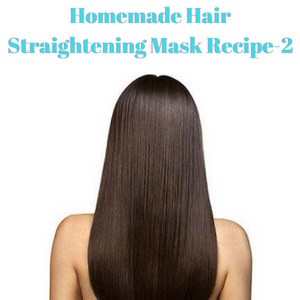 Trust me, if you use this mask every week your hair will be healthy, shiny and straight for a long time. Almond oil contains all kinds of healthy ingredients for hair such as omega-3 fatty acids, phospholipids, vitamin E and magnesium. hence it gives silkiness to your hair. Using almond oil nourishes and strengthens your hair. It is also optimal for treating hair loss and damaged hair. A few drops go a long way to add silkiness and shine & nourish the scalp. The coconut milk in this mask makes your hair strong, luminous and shine. Corn flour has moisture absorbing properties and also helps kill bacteria. It will also add sheen to your hair. An important thing you have to remember is that your hair don't get permanent straighten by one application of this mask . Apply this mask to your hair until it gets straighten. If this mask doesn't work for anyone for the first time don't worry coz if your hair is too curly or damaged you will feel the difference after 5 applications or so. Try this mask and let me know how it worked for you!